What is the DDD study? Thousands of babies are born each year in the UK who do not develop normally because of errors in their genetic makeup. We call these problems developmental disorders and they are often obvious from shortly after birth. problems with learning and behaviour. Currently, we often do not understand why a developmental disorder has occurred. This means that in most cases we are unable to tell the patient or their family why this has happened to them. 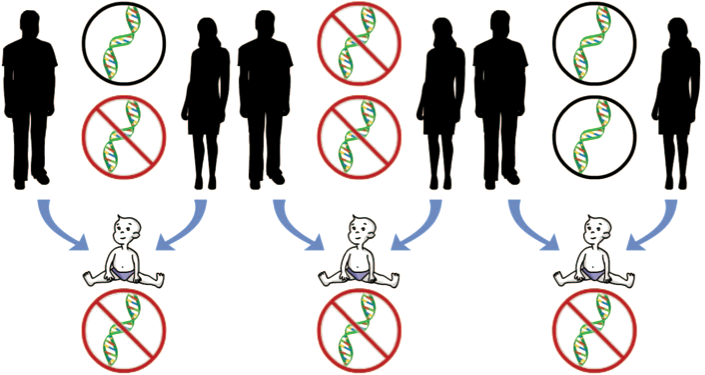 However, we know that many developmental disorders are due to errors in a person's genetic makeup. Some of these will have come from one or both parents and some of them will have happened for the first time in the patient. If we can make a diagnosis of the cause of the disorder, we are better able to care for the patient and to counsel the family about the risk of having another affected child. Currently, diagnosis is restricted to a small minority of children and requires the clinician to recognise the appearance of the child and the pattern of symptoms. This is supplemented by the use of microscopes to identify large rearrangements of the genetic material in chromosomes or focussed testing of a single gene. Research shows that the latest molecular testing methods identify previously undetectable changes in chromosomes allowing new diagnoses to be made. However, clinical use is hampered by the limited availability and inconsistent application of these technologies, and by lack of basic knowledge to link genetic changes directly to symptoms. The consequence is that clinical diagnoses currently remain impossible except for a small number of children. The most important objective of DDD is to improve our understanding of the many different causes of developmental disorders. This goal is important from a medical, scientific and family perspective as it will allow us to make accurate diagnoses and help understand the function of individual genes. While most of our efforts are concentrated on developmental disorders that are apparent at birth or in early life, some such conditions can have their main effects in adult life. For instance, certain heart malformations can have no adverse effect during childhood but will cause disease later on, and schizophrenia, an important condition that presents in late adolescence or early adult life, exhibits clear differences in early brain development. We feel that studying such disorders is an important component of DDD and to this end we also extended recruitment to undiagnosed adults with developmental disorders.